Healthy foods for a healthy smile. 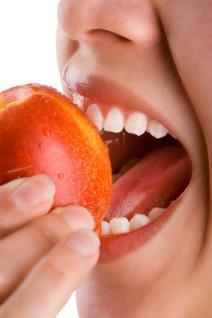 There are significant links found between nutrition and bleeding gums. In fact, according to an article in "Health Store News", 90 percent of Americans will experience some form of gum disease during their lifetime, with 25 percent losing some or all of their teeth by the age of 60. The statistics are scary, but with a focus on a healthy diet, you can have healthier gums and teeth. The relationship between nutrition and bleeding gums is quite simple. Good oral health doesn't just include regular brushing and dental visits. What you put into your body has a direct bearing upon your health, and this includes the condition of your gums as well. Bleeding gums are often associated with scurvy. Scurvy is a disease that is caused by a vitamin C deficiency. Most people don't realize that healthy gums need high amounts of vitamin C. While you might exercise and eat right, even a minor vitamin C deficiency can affect the condition of your gums, causing bleeding in many cases. However,high vitamin C deficiencies can lead to more serious gum problems. Characterized by spongy, bleeding gums, gingivitis if left untreated can lead to periodontis, a condition that slowly eats away at the jawbone and causes tooth loss. Periodontis occurs when an accumulation of plaque causes pockets to occur within the gums. These pockets trap more plaque, which can lead to serious gum disease. Inflammation of these gums can be reduced, however, with a variety of antioxidants, including vitamins A, C, D, and E.
Not all foods are good for your gums. While foods, such as leafy vegetables, fruits and dairy products are great for your overall health, other foods high in sugars and starches can play havoc on your teeth and thus affect your gums. Sticky, sugary foods encourage bacteria growth, which in turn causes the growth of plaque on your gums and teeth and leads to bleeding gums. It is important to brush, floss, and rinse on a regular basis to ensure the health of your teeth and gums. You should also schedule dental visits every six months for teeth cleanings and exams. Pregnant women are often surprised to discover that their once healthy mouth now bleeds each time they floss and/or brush their teeth. Many women worry about gum disease when this occurs. Although this certainly may be the cause of bleeding gums, another cause may involve a rise in progesterone levels and an increased blood supply. Referred to as pregnancy gingivitis, if progressive, this condition can lead to more serious problems, including premature birth. Pregnant women should practice good oral hygiene and visit their dentist for a check-up and cleaning. The relationship between nutrition and bleeding gums is important to understand. Besides the traditional care of your gums and teeth, there are some natural remedies you can consider as well. Acerola Cherry Extract- This nutrient provides one of the richest natural sources of vitamin C. It is an immune boasting nutrient which helps the growth and repair of tissue. Bamboo Tabashir- Its main active ingredient is naturally occurring silica, which is known as one of the most deep-acting remedies. Silica prevents cavities and preserves teeth by hardening the enamel. It acts as a general rejuvenating agent and improves the condition of the hair, nails, teeth, gums and skin. Capra Mineral Whey- A natural, immune system strengthener which contains more than 20 naturally occurring minerals. Zell Oxygen-Rich in all B Vitamins as well as A, E, D, K, beta carotene, minerals, trace elements, and amino acids. Studies have shown this nutrient to be highly effective in the treatment of periodontal disease. Zell oxygen is a wonderful, natural remedy for bleeding gums. The care and treatment of your teeth and gums is essential to your overall health. Visit your dentist regularly, and contact him or her with any questions or problems you might be experiencing.